Continuing the story…..We left Rowes Bay at 9.30am and headed straight for the Lakes (Stage 1) near Castletown. The Lakes is a great place to take the kids as they can run around, go exploring, and if they fall in, it’s pretty easy to fish them out! It is also pretty snag-free, apart from the occasional shopping trolley! 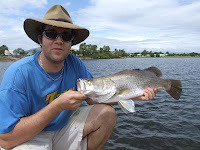 We had run into Wes at Rowes Bay and he also decided that he was up for a bit more fishing so he joined us at the Lakes. The secret to fishing the Lakes is simple – don’t use any sinkers and dead baits always seem to outfish live baits – weird, but true! Fresh green back herring fillet is my favourite, with fresh peeled prawn a very close second. 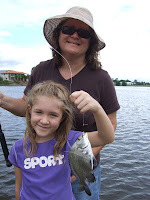 Within minutes Trisha had landed her first bream, then another, and another, and a little while later, another. She must have been sitting right in the honey hole because no one else was catching anything. By now everyone was casting into Trisha’s special little spot, but it didn’t seem to help. 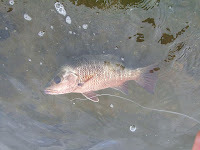 Yes, she was on again – this time a nice fat mangrove jack. It was at this point that Wes realised that he still had a sinker on, so off it came and out went a juicy looking unweighted peeled prawn. I don’t think he even finished his sentence when his rod went over and he was on. A few minutes later and Wes’s first barra was safely landed. Not to be out done, Trish was on again and following Wes’s lead, landed another barra. A couple of missed hook-up’s followed, before things went quiet again. By now it was 11.30am and time to go. A great morning with family and friends – and no boat to wash!